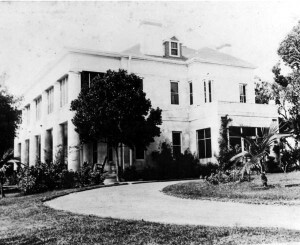 Following the sale of his home and office in 1916, Dr. James Jackson moved his family to 300 Boulevard in downtown Miami. The street was later renamed to Biscayne Boulevard, but the Jackson family moved to the Brickell Neighborhood long before the boulevard was renamed. When Dr. Jackson sold his property on Twelfth Street and Avenue B (Flagler Street and NE Second Avenue), he negotiated a lifetime lease for an office in the building that replaced his former residence. The city directories from 1917 until his death in 1924 listed his medical office at the Hippodrome Building. The Hippodrome was the name of the commercial building that replaced Jackson’s home. 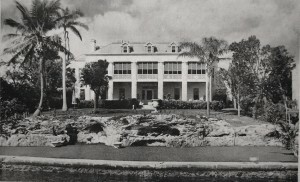 The Jackson family lived at 300 Boulevard until their mansion was completed in Brickell in 1919. The home was at 1627 Brickell Avenue and is the second home from the left in the aerial photograph of Brickell Millionaire Row in 1948 (Figure 1). This is the third in a series of articles on homes featured in the aforementioned photograph. The Jackson home was described as “colonial” in architecture. Like so many other homes in this area of the Brickell neighborhood, the residence was set back from the avenue and situated close to the bay. The Jackson’s fondly remembered the beauty and serenity of their first home on Twelfth (Flagler), Street when they selected the lot to build their Brickell home. All the thick pine trees and tranquility of the area is what they had hoped to replicate in their Brickell home. The pine trees and foliage in the front of the home were preserved for both privacy and beauty. The intent of Mrs. and Dr. Jackson was to create a family estate that would immediately feel like home. They even named their residence Homewood as a reminder of their intentions. Homewood was well designed with large bay windows to provide unobstructed views of beautiful Biscayne Bay. Homewood featured large and prominent columns in both the front and back of the mansion. The home was finely situated at the top of a bluff. This part of Brickell featured higher elevation than other parts of the area. The long driveway from Brickell Avenue to the front of the home terminated in a circular roundabout along the north side of the home. The Jacksons most likely also owned the lot at 1617 Brickell Avenue, which was just north of their new residence. However, the empty lot remained undeveloped for many years following the completion of Homewood. The Jacksons remained in their home until the sudden death of Dr. James Jackson on April 2, 1924. He passed away in his beloved Homewood residence. Ethel, the widow of Dr. Jackson, rented the home to an affluent winter visitor in the next two years following the death of the doctor. The city directory listed Bernard F. Gimbel as the resident in 1925 and 1926. Bernard Gimbel was the head of Gimbel Brothers Department Store, a director of Coca-Cola Company and elected chairman of the board of directors for Madison Square Garden in 1947. The Milwaukee and Philadelphia based Gimbel Brothers was so prominent in the first half of the twentieth century that the company acquired Saks Fifth Avenue in 1922. Saks operated under Gimbel Brothers for many years following the merger. The company was widely known for creating the Gimbel’s Thanksgiving Day Parade. The retail giant was in business from 1887 until 1987. Bernard Gimbel was a long time visitor to Miami. Although it isn’t clear if he ever built his own winter home in the area, he did typically stay in the Brickell area of Miami during his stay. Given the length of time he was listed at Homewood, it is unlikely that Gimbel ever purchased Homewood. The residents listed at 1627 Brickell after Gimbel help build the case that ownership remained with the Jackson family during Gimbel’s residency at the mansion. The 1927 Polk City Directory listed Byron B Freeland as the resident of Homewood. Freeland married Helen Jackson in the early 1920s. Helen was Dr. James Jackson’s middle child and his youngest daughter. She was featured in a photograph with her father in front of the Royal Palm Hotel in roughly 1905. She was about three years old at the time of the photograph. Byron Freeland operated a drug store that later became a mid-priced retail establishment called Byron’s Department Store. Byron’s first store was located on Flagler Street in downtown Miami. The name changed to J. Byrons in the late 1950s as part of an acquisition by Jackson Stores. There is no known connection between Dr. James Jackson’s family and the proprietors of the Jackson Stores. Eckerd Corporation bought the chain in 1968. Eckerd’s then sold their interest in J Byrons in 1985. Ultimately, the remaining stores were sold to Upton’s in 1991. Byron and Helen Freeland left the Brickell area in 1930 and moved to Grove Park. They remained at NW Tenth Street in Grove Park until their divorce in 1936. The location of their Grove Park home would have been around the location of the Dolphin Expressway between 15th and 17th Avenues. At the time that Byron and Helen moved out of Homewood, Dr. Jackson’s widow, Ethel, moved back into the mansion. She remained in the home until 1935. A couple of years later she passed away. Ethel Barco Jackson died on October 28, 1937. After Ethel Jackson left Homewood for the final time in 1935, the occupants of Homewood changed frequently over the next few years. Carl Adams lived in the mansion in 1936. Dr. Jackson and Ethel’s only son, James M. Jackson Junior, was listed as the resident in 1937. Finally, Helen Freeland was listed as the resident of Homewood in the 1938 directory. It appears that Helen’s intention was to live in her childhood home for only one year while her home was being built on the lot just north of 1627 Brickell Avenue. By the late 1930s, the lot to the north of Homewood was still vacant. The address of this lot was 1617 Brickell Avenue. In 1938, Helen Jackson Freeland built her mansion at this location. The home is the third home from the left in the aerial photograph of Brickell Millionaire Row (Figure 1). While Helen transitioned from Homewood to her own home, her older sister and family occupied into the family mansion at 1627 Brickell Avenue. Dr. Thomas and Ethel Hutson moved into Homewood in 1939. The two sisters and families lived next door to each other until 1943. The Hutson’s moved to Coconut Grove. Helen Jackson Freeland remained in her Brickell home until 1944. Helen passed away on April 4, 1954. Following the departure of the Jackson sisters from the 1600 block of Brickell Avenue, the two mansions were owned by someone other than the Jackson family for the first time since each was built. 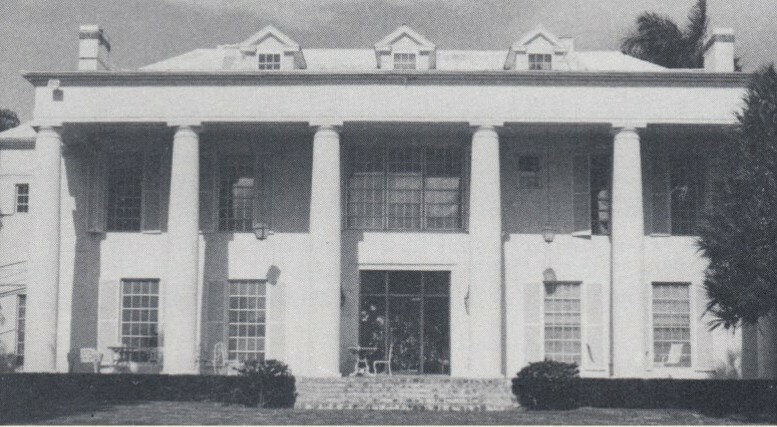 Helen’s mansion was bought by Puerto Rican businessman Antonio Miranda in 1945. Miranda owned 1617 Brickell Avenue until the mid-1950s. Architect and real estate broker Harry Wohl owned the mansion from the mid-1950s through the 1970s. In 1944, businessman Herbert C Craft purchased 1627 Brickell Avenue (Homewood), and lived there for five years. Craft sold the mansion to Lyman M. Lowry in 1949. The founder of Lowry Research Corporation, Lyman Moody Lowry, owned Homewood from 1949 until 1952. Lyman Lowry started his career as a stock broker in 1925. Based on his observations of the causes for the stock market crash of 1929, Lowry came up with a set of standard indicators to help predict stock performance. Lowry Research is still in business today and operating out of Palm Beach Gardens, Florida. In 1952, Jose Ferre purchased the home, but wasn’t listed at 1627 Brickell Avenue until 1957. He was a member of a prominent Puerto Rican family. His brother was Governor of Puerto Rico and his family was held in very high regard in their home commonwealth. During World War II, Jose Ferre built his wealth by buying bankrupt manufacturing companies. At one point, the Ferre family had ownership interest in eighty different corporations located in Puerto Rico, United States, Panama and Venezuela. In 1965, the Ferre Florida Corporation financed and built the 30-story New World Tower in downtown Miami. At the time, the building stood as the tallest building in the state of Florida. Jose Ferre’s son, Maurice, married Mercedes Malaussena in 1959. Mercedes lived next door to the Ferre’s in the Santa Maria mansion on Brickell. The Santa Maria will be discussed in the final article on the series of Brickell Millionaire Row. It is the home at the far left in Figure 1. Maurice Ferre was a six-term Mayor of Miami. He was the first Hispanic mayor in the city’s history. A few years after his marriage to Mercedes Malaussena, Maurice moved next door and lived in Santa Maria until they sold the property in 1980. Jose Ferre was listed at Homewood until 1968. Jose Ferre sold the Homewood mansion to Peter D. Coe. The Coe family owned and lived in 1627 Brickell from 1969 until the mid-1970s. The last couple of residents listed at the Homewood mansion were William Charles and Oscar Delatorre in the late 1970s and very early 1980s. Both Homewood at 1627 Brickell Avenue and the Freeland home next door at 1617 Brickell Avenue were razed in the early 1980s. 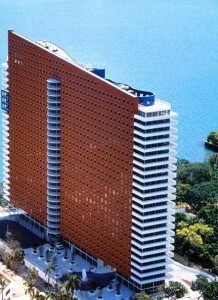 Arquitectonica’s Imperial at Brickell was built and completed in 1983 on the location of both of the Jackson family mansions. The next and last article in this series will discuss the mansion located south (far left in Figure 1), of Homewood. The property was not only the location of the Santa Maria mansion, but was also the Lewis family homestead dating back to 1805. Article: Brickell Homeowners Association Blog. Cover Image: Jackson home in 1920. Courtesy of Dade County Historic Preservation Division. Figure 2: Bay view of back of Homewood. Courtesy of Paul Hampton Crockett. 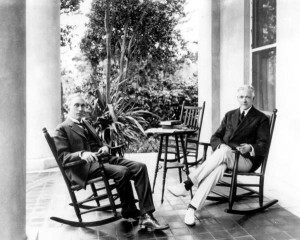 Figure 3: Dr. Jackson and Lewell S Barker sitting on Homewood porch. Courtesy of Florida Memory. 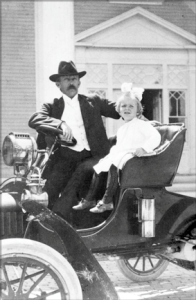 Figure 4: Dr. Jackson and daughter Helen in front of Royal Palm Hotel in 1905. Courtesy of Florida Memory. Figure 5: Side view of Homewood looking north to south. Courtesy of Florida Memory. 4 Comments on "Brickell’s Millionaire Row – Homewood"
You never mention that the original name was Jackson Byron’s. My mom worked at the warehouse in Golden Glades with the wife of Captain Marvel (Shazam! now due to trademark issues) artist CC Beck. This was at least early 70s. Sometime in the 80s the name was shortened to J Byrons. That is my great uncle, Lyman Lowry. Wish the mansion row still existed, sadly there were so many torn down to accommodate modern high rises. Thanks for commenting, April. I agree that it would be great to still have some of those homes standing. There really were not a lot of pictures of the homes to really appreciate old Brickell.